where do birds go to die? : why does new years eve have to be so messy? why does new years eve have to be so messy? I'll admit that when I was younger, it seemed hard to have fun without alcohol. That's not going to change just because i grew out of it. Kids will be kids and drinking to excess is a bogan rite of passage, whether the bogan is a hipster, a hippy or whatever other clothing style they have adopted. I just wish people would clean up after themselves. I live in Fitzroy North, right next to cool Fitzroy. 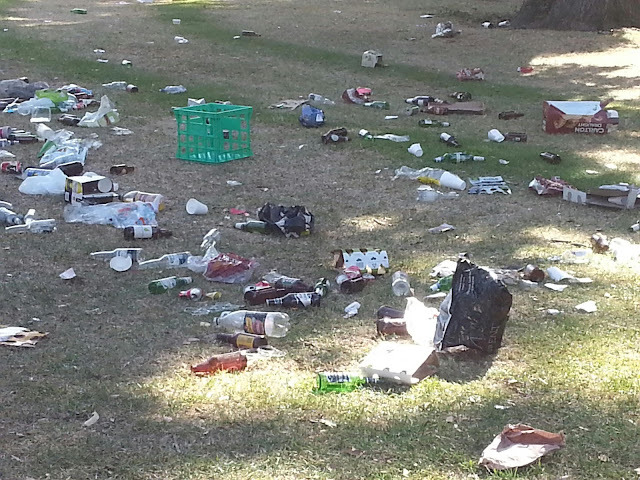 On a nice night, spontaneous parties pop up all over the neighbourhood, in parks, front yards, grassy patches etc. As soon as evening temperatures exceed 20 degrees Celsius our local park, the Edinburgh Gardens, comes to life. Groups bring their food booze and music and make the most of the fresh air and soft ground. It's not a bad atmosphere. Unfortunately, the nicer the night, the worse shape the park is left in for those of us who use it during the day. 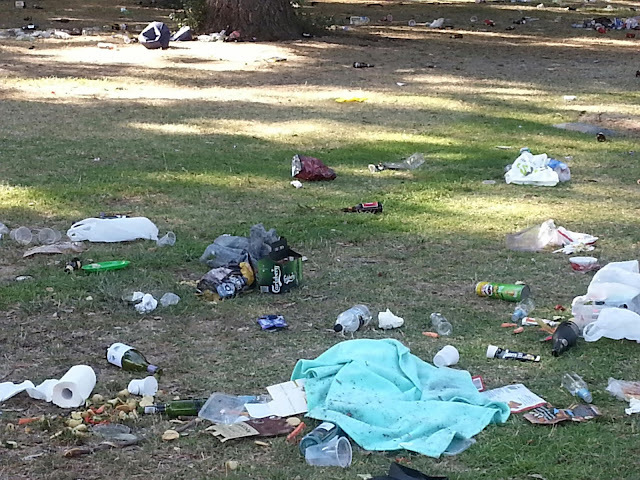 After a normal temperate night, the park is littered with bottles, food waste, sleeping drunk people and abandoned clothing. After New Years Eve it hits a whole new level - photographic evidence below. 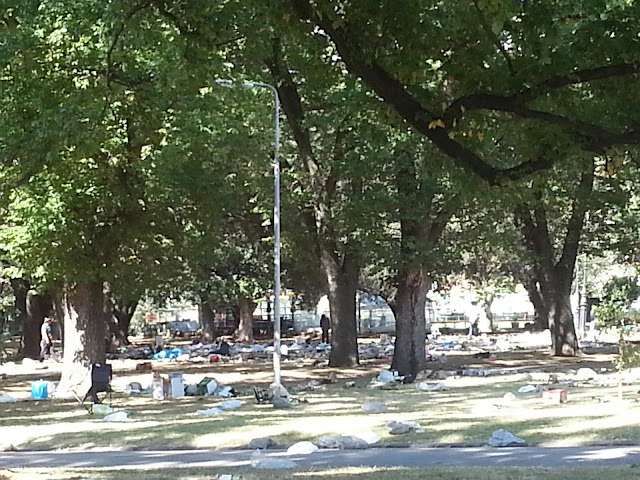 It can't be too hard to at least bag your rubbish if there are not enough bins. 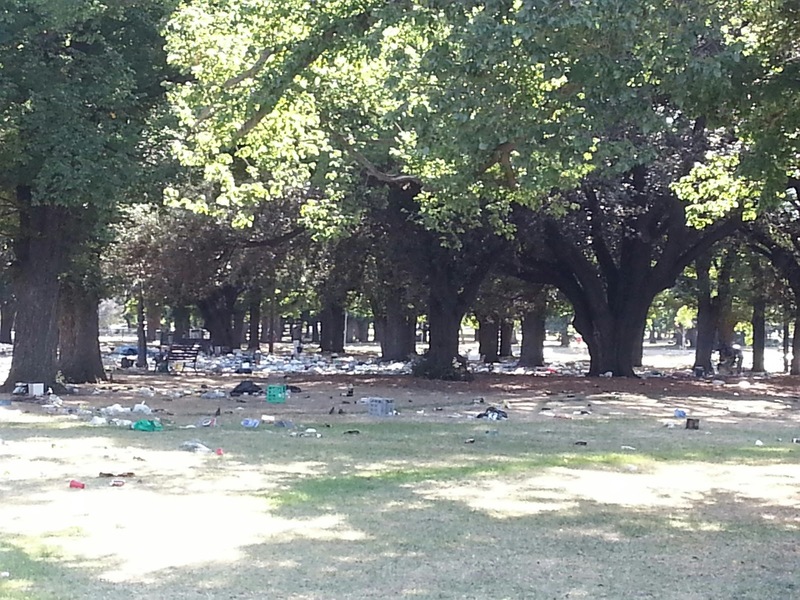 The worst part is that lots of bottles have been smashed, making the park too dangerous to take my child for a play in the grass. I know it's not just the hipsters, but locals don't call the Edinburgh Gardens hipster park for no reason. I just got back from a bike ride with my wife. Rode through Edinburgh gardens and was absolutely disgusted. How can they do this? Some of them were even too drunk / lazy to carry their cool bags and eskies home. Last time I remember these things don't come for free with your ciders & craft beers? 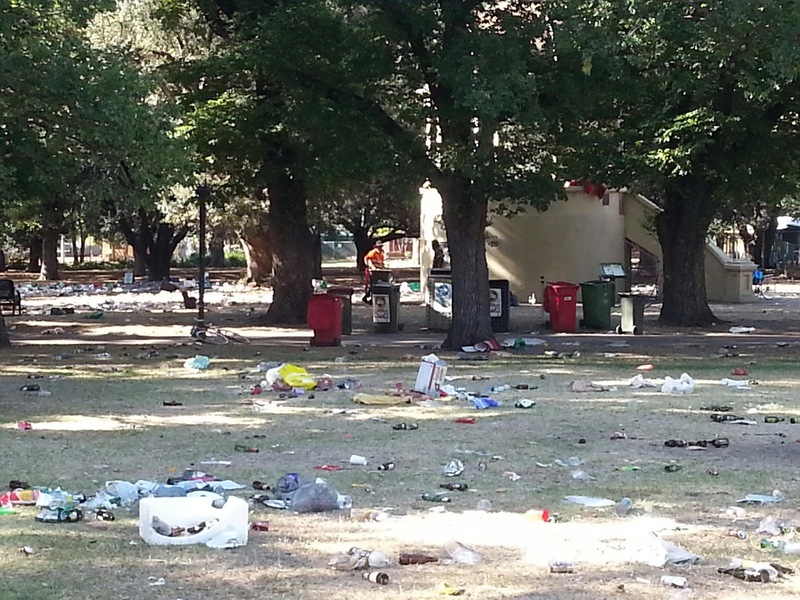 The council cleaners already started cleaning up at midday, though I doubt they can finish it off anytime soon.. Some of the (older) locals were out walking their dogs and were speechless. It's just an ocean of rubbish.. I am a gen Y and I am ashamed..
Just read the article in the Age. I didn't know that NYE in the park was an illegal dance party. Yes, it was worse than usual but I still think that the park is left in pretty bad shape even after a normal warm evening.